Gliding is when an object or animal goes through the air without active flight. All gliders use an aerofoil to slow their rate of descent. Glider planes have wings, and gliding animals have membranes which they stretch out. By using rising air they can prolong their stay in the air. The word 'soaring' describes this, and is also used for the sport of gliding. Air will rise if it is heated by the ground or if it is deflected by mountains. Improvements in aerodynamics, in instruments and in the understanding of the weather have allowed flights over great distances at high speeds. The world record distance is now over 3000 km. Good gliding weather: Well-formed cumulus humilis, with darker bases, suggests active thermals and light winds. wave lift (standing waves in the atmosphere, analogous to the ripples on the surface of a stream). Ridge lift rarely allows pilots to climb much higher than about 600 m (2,000 ft) above the terrain; thermals, depending on the climate and terrain, can allow climbs in excess of 3,000 m (10,000 ft) in flat country and much higher above mountains; wave lift has allowed a glider to reach an altitude of 15,447 m (50,671 ft). In a few countries, gliders may continue to climb into the clouds in uncontrolled airspace, but in many countries the pilot must stop climbing before reaching the cloud base (see Visual Flight Rules). Thermals are streams of rising air that are formed on the ground through the warming of the surface by sunlight. If the air contains enough moisture, the water will condense from the rising air and form cumulus clouds. Once a thermal is encountered, the pilot usually flies in circles to keep the glider within the thermal, so gaining altitude before flying off to the next thermal and towards the destination. This is known as "thermalling". Climb rates depend on conditions, but rates of several meters per second are common. Thermals can also be formed in a line usually because of the wind or the terrain, creating cloud streets. These can allow the pilot to fly straight while climbing in continuous lift. 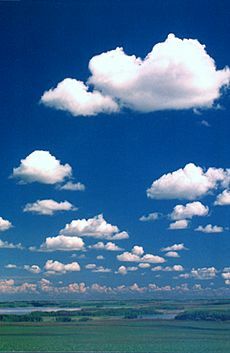 When the air has little moisture or when an inversion stops the warm air from rising high enough for the moisture to condense, thermals do not create cumulus clouds. Without clouds or dust devils to mark the thermals, the pilot must use his skill and luck to find them using a sensitive vertical speed indicator called a variometer that quickly indicates climbs or descents. Typical locations to find thermals are over towns, freshly ploughed fields and asphalt roads, but thermals are often hard to associate with any feature on the ground. Occasionally thermals are caused by the exhaust gases from power stations or by fires. As it requires rising heated air, thermalling is only effective in mid-latitudes from spring through into late summer. During winter the solar heat can only create weak thermals, but ridge and wave lift can still be used during this period. A ridge soaring pilot uses air lifted up the sides of hills. It can also be augmented by thermals when the slopes also face the sun. In places where a steady wind blows, a ridge may allow virtually unlimited time aloft, though records for duration are no longer recognized because of the danger of exhaustion. The powerfully rising and sinking air in mountain waves was discovered by a glider pilot, Wolf Hirth, in 1933. Gliders can sometimes climb in these waves to great altitudes, though pilots must use supplementary oxygen to avoid hypoxia. 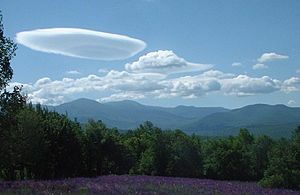 This lift is often marked by long, stationary lenticular (lens-shaped) clouds lying perpendicular to the wind. Mountain wave was used to set the current altitude record of 50,699 feet (15,453 m) on August 29, 2006 over El Calafate, Argentina. The pilots were Steve Fossett and Einar Enevoldson, who were wearing pressure suits. The current world distance record of 3,008 km (1,869 statute miles) by Klaus Ohlmann (set on 21 January 2003) was also flown using mountain waves in South America. A rare wave phenomenon is known as Morning Glory, a roll cloud producing strong lift. Pilots near Australia's Gulf of Carpentaria make use of it in springtime. 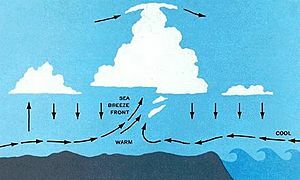 Schematic cross section through a sea breeze front. If the air inland is moist, cumulus often marks the front. The boundaries where two air masses meet are known as convergence zones. These can occur in sea breezes or in desert regions. In a sea-breeze front, cold air from the sea meets the warmer air from the land and creates a boundary like a shallow cold front. Glider pilots can gain altitude by flying along the intersection as if it were a ridge of land. 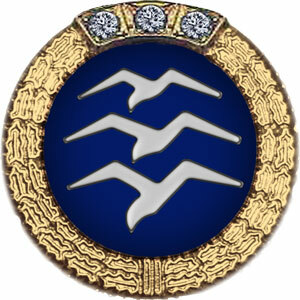 Convergence may occur over considerable distances and so may permit virtually straight flight while climbing. 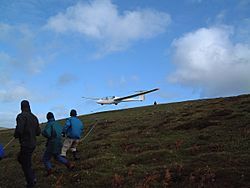 Glider pilots have been able to use a technique called "dynamic soaring", where a glider can gain kinetic energy by repeatedly crossing the boundary between air masses of different horizontal velocity. However, such zones of high "wind gradient" are usually too close to the ground to be used safely by gliders. Gliders, not having engines, use various methods to take off. Glider pilots who want to use the different types of launch methods must be in current practice in each. 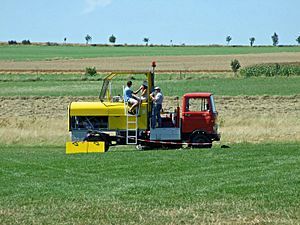 Licensing rules in some countries differentiate between aerotows and ground launch methods, due to the widely different techniques. Aerotows normally use single-engined light aircraft, although motor gliders have also been permitted to tow gliders. The tow-plane takes the glider to the desired height and place where the glider pilot releases the rope. A weak link is often fitted to the rope to ensure that any sudden loads do not damage the airframe of the tow-plane. During the aerotow, the glider pilot keeps the glider in one of two positions behind the tow-plane. This position can either be the "low tow" position, just below the wake from the tow-plane, or the "high tow" position just above the wake. In Australia the convention is to fly in low tow, whereas in the United States and Europe the high tow prevails. 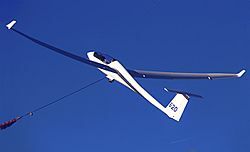 One aerotow variation is to attach two gliders to one tow-plane, using a short rope for the high towed glider and the long rope for the low tow. A Ventus 2b being winch-launched at Lasham Airfield. Gliders are often launched using a stationary ground-based winch mounted on a heavy vehicle. This method is widely used at many European clubs, often in addition to aerotowing. The engine is usually a large diesel, though hydraulic fluid engines and electrical motors are also used. The winch pulls in a 1,000 to 1,600 m (3,000 to 5,500-foot) cable, made of steel wire or a synthetic fiber, attached to the glider. The cable is released at a height of about 400 to 700 m (1,300 to 2,200 feet) after a short and steep ride. The main advantage of a winch launch is its lower cost, but the launch height is usually lower than an aerotow, so flights are shorter unless the pilot can quickly make contact with a source of lift within a few minutes of releasing the cable. Although there is a risk of the cable breaking during this type of launch, pilots are trained to deal with this. Another launch method, the "autotow", is rarer nowadays. The direct towing method requires a hard surface, a powerful vehicle and a long steel cable. After gently taking up slack in the cable, the driver accelerates hard and the glider rises like a kite to as much as 400 m (1300 ft) if there is a good headwind and a runway of 1.5 km (1 mile) or more. This method has also been used on desert dry lakes. A variation on this is the "reverse pulley" method in which the truck drives towards the glider that it is launching with the cable passing around a pulley at the far end of the airfield, with an effect similar to a winch launch. Bungee launching was widely used in the early days of gliding, and occasionally gliders are still launched from the top of a gently sloping hill into a strong breeze using a substantial multi-stranded rubber band, or "bungee". For this launch method, the glider's main wheel rests in a small concrete trough. The hook normally used for winch-launching is instead attached to the middle of the bungee. Each end is then pulled by three or four people. One group runs slightly to the left, the other to the right. Once the tension in the bungee is high enough, the pilot releases the wheel brake and the glider's wheel pops out of the trough. The glider gains just enough energy to leave the ground and fly away from the hill. Good gliding weather: Competitors studying cumulus humilis, which suggest active thermals and light winds. Gliding Facts for Kids. Kiddle Encyclopedia.